The bookshelf had a picture of three rows of five fish. The door had an image of four rows with three beach pails in each. Several other pictures were strategically placed in different corners of the brightly decorated classroom. The students cradled clipboards with a worksheet as they moved from spot to spot, writing out mathematical expressions such as: 5+5+5 = 15 and 3+3+3+3+3=15, to convince themselves that three fives is the same as five threes. But three of the students were seated on the carpet in the middle of the room. They were getting “Dolphin time” — individualized instruction with Bowling, who was talking them through the difference between rows and columns. Two dolphins on the rug are African-American. While the classes at Dunn Elementary have kids of all skill levels mixed together, there is, on average, a persistent gap between many kids of color and the rest of the students. The different levels are designated as tiers. “Tier-3” kids, such as the dolphins, are those not meeting expectations on in-class tests, and Bowling was working to catch them up. Students don’t start taking standardized tests until third grade, but Bowling is still tracking her students closely. A lot is at stake. It was hoped that the persistent gap would be closing by now. It’s been over five years since Kentucky adopted the Common Core, guidelines for what students need to know in math and the English language arts in each grade. Introduced as an ambitious educational reform at the end of the last decade to make sure that, across the U.S., students graduating from the K-12 system are college and career ready, Common Core has ramped up academic expectations that schools everywhere, including those in Kentucky, are still far from meeting. Kentucky stepped into the national spotlight in 2010 when it became the first state to adopt the standards after the Obama administration offered federal money to help pay the costs. (Over 40 other states and the District of Columbia eventually adopted the Common Core.) On Kentucky’s previous state tests, tied to its old standards, over 70 percent of elementary school students scored at a level of “proficiency” or better in both reading and math. Once the state introduced the Common Core-aligned tests in the spring of 2012, that percentage dropped 28 points in reading (to 48 percent) and 33 points in math (to 40 percent), according to the Kentucky Department of Education. Middle and high school students’ scores also dropped. Scores have been edging up ever since. 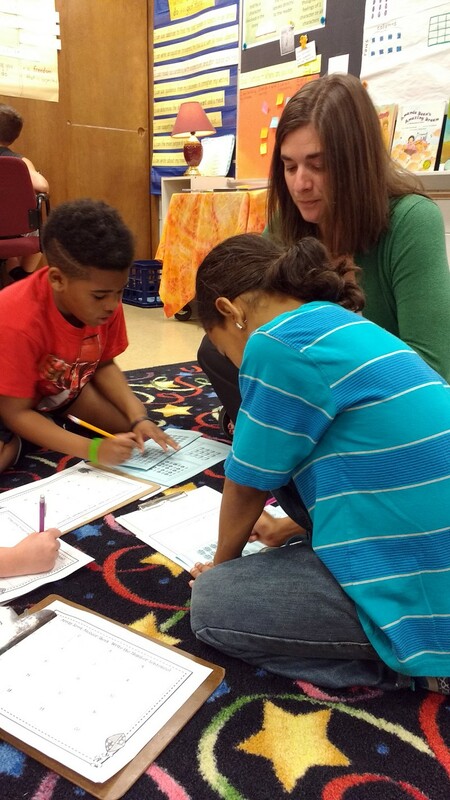 By spring 2015, 54 percent of Kentucky elementary school students were proficient in the English language arts and 49 percent were proficient in math. Despite that improvement, within those numbers are hidden divisions that have existed for decades. Breaking the scores down shows that African-American students fare much worse than their white peers. 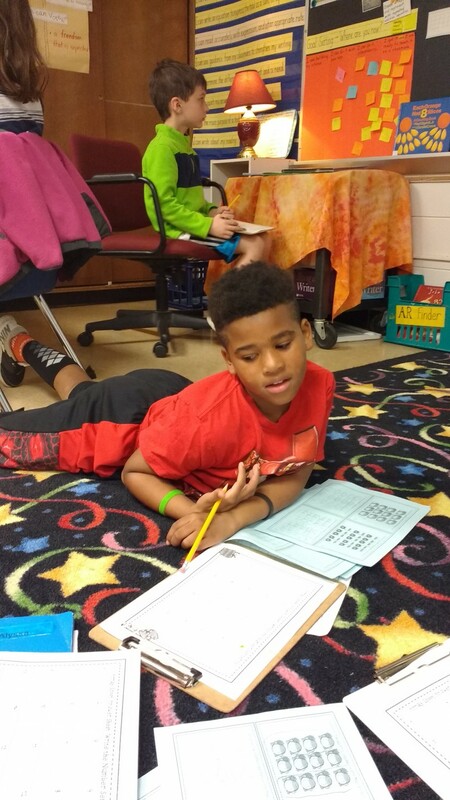 In spring 2015, in the elementary grades, 33 percent of black students were proficient in reading, versus 58 percent of white students; in math, the breakdown was 31 percent to 52 percent, according to Kentucky Department of Education figures. 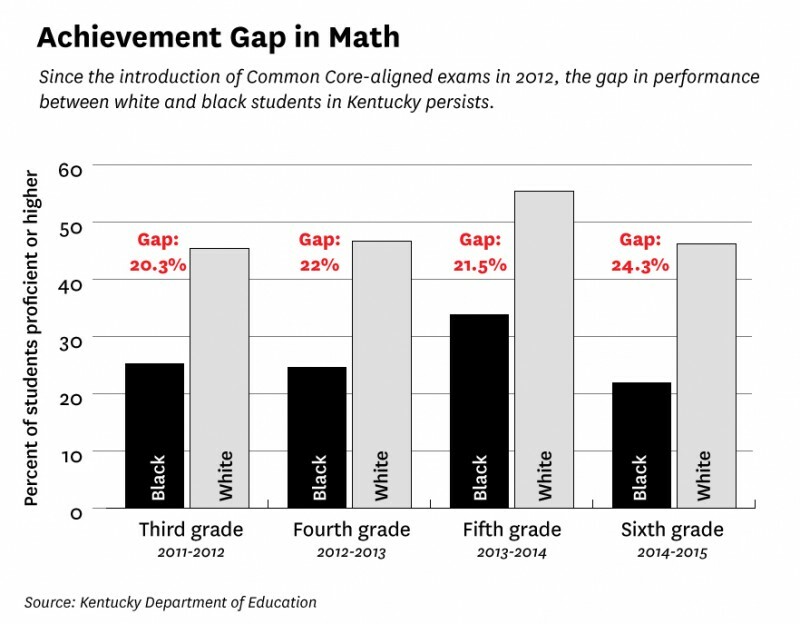 And those gaps, in many cases, have widened, according to an analysis of state testing data by The Hechinger Report and the Courier-Journal. In Jefferson County Public Schools in 2011-12, the first year of Common Core testing, 25 percent of black third-graders were proficient or better in reading, compared to 54 percent of white third-graders. By 2015, when the majority of those same students likely had reached sixth grade, the percentage of proficient black sixth-graders had inched up 2 points while that of white sixth-graders had increased more than 4 points. The students at Dunn Elementary, located in a leafy and affluent section of Louisville, had average scores about 20 points higher than the rest of the state. From 2012 to 2015, its white and black students saw improvement on reading tests, and the black students in many cases outscored their black peers in the rest of the district. But at the same time, white students at Dunn scored proficient or better in both math and reading at more than double the percentage of black students. Closing these gaps was one of the goals of Common Core reform. In the past, “Schools that were in low-income areas and predominately served students of color often had very low standards for their students that did not prepare them adequately. When the [Common Core] standards were first introduced, I sent them to my sister, a college professor of English, and she wrote back right away, ‘Yeah, this is what you need to succeed in college,’ ” said Sonja Brookins Santelises, vice president of K-12 policy and practice at the Education Trust, a Washington, D.C.-based research group. Now, Kentucky finds itself at a crossroads. With four years’ worth of testing to show after its quick embrace of Common Core, it’s clear that raising standards was not enough to help all learners. In a state that has tried and failed for decades to eradicate disparities for its low-income and black students, Santelises said, “We knew that the tougher standards had to be followed up with extra attention to students who were behind.” The recent results have sparked new ideas and fueled a redoubled effort to reach those kids. “Array” was not a term commonly heard in a second-grade math class before Common Core. It’s a computing term that allows users to scale up large amounts of data in list-like sets handy for programming. But Common Core introduced arrays as a way for students to grasp that adding groups of numbers together is a form of multiplication. Part of Common Core’s mission was to streamline math, cutting out the fluff that bogged down old standards in many states, and focusing instead on learning concepts in a progression that will teach kids what they need to know to master algebra in high school. 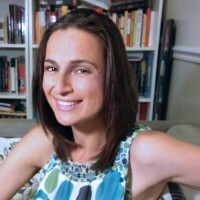 Heather McGovern, a former teacher (now a counselor) at Bowen Elementary, also in Louisville, said “the previous standards were bulky.” Common Core has made it easier to teach time, for example, by splitting learning about hours and minutes into separate strands across three grades instead of grouping them together. The Common Core was also intended to add a deeper level of inquiry to math class: making the ability to describe how you arrived at a solution as important as memorizing facts. Teachers are supposed to make children partners in the acquisition of knowledge, helping them to see that math isn’t only — or even mainly — about right answers, it’s about exploration and discovery, and the sort of critical thinking and problem-solving they’ll do in college some day. Back at Dunn, Bowling was very explicit about students’ need to master repeated addition before moving on. “Is multiplication the standard for second grade?” she asked the class of 24 kids. “Nooooo,” they roared back knowingly. “That’s right!” Bowling affirmed. Multiplication doesn’t come until third grade, but at Dunn, educators want students to be able to see how their learning will progress. Standing off to the side and periodically asking the students to tie their shoelaces or say, “Excuse me” as they pranced about the room, Principal Tracy Barber explained that “Dolphin time” is a reference to the Dunn mascot. Calling the group that needs extra help something special is a way to get the Tier-3 students to feel encouraged rather than discouraged about the distance they need to go to catch up with their peers. “No kiddo is stigmatized. It’s all hands on deck till all my students meet the standards,” Barber added. Barber knows it. In practice, getting everyone to that “foundation for understanding” requires plenty of attention and effort by the teachers. The kids from the other parts of the city are bussed here as part of a managed choice plan. The plan means that unlike schools in many big urban districts, every school here has some level of racial and economic diversity. It also means that in Louisville the achievement gap is everyone’s problem. Even here in the affluent suburbs, a big part of Barber’s job is to make sure that every child, whether from down the street or downtown, is making progress. 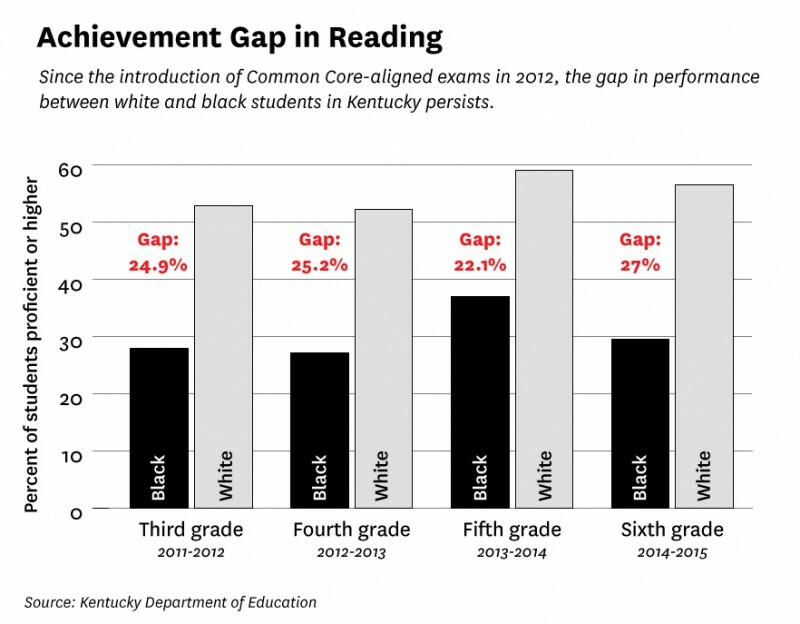 In spring 2015, in the elementary grades,33 percent of black students were proficient in reading versus 58 percent of white students; in math, the breakdown was 31 percent to 52 percent, Kentucky Department of Education figures reveal. “Every fall I sit down with the scores and think about what can be done to help the learners who are behind,” Barber said. When she became principal in August 2014, Barber started the tier system. Though students of all levels are in the same classroom most of the time, advanced students are sometimes pulled out for enrichment and the children not meeting expectations get more time with the teacher. Barber isn’t sure yet if the sort of individual instruction Tier-3 students are getting with Bowling is working. “There are some kiddos who start school behind. They aren’t coming from a print-rich environment, they don’t have the same word acquisition,” she said. That’s why this summer the school is going further to reach its neediest kids: Teachers at Dunn are volunteering their time for a three-day camp for entering kindergarteners, to teach them the key concepts they’ll need to know before school starts. Hold a book, name different colors, count up to 30, recognize letters and name parts of the body such as the nose, elbows, knees and stomach. While these tasks may sound easy, only half of the 7,000 children entering kindergarten every year in the Jefferson County Public Schools are deemed ready by Kentucky’s school readiness assessment (known as Brigance), according to Jimmy Wathen, an early education specialist at JCPS. As many researchers have noted, socio-economic differences among families — which often track with race — account for one of the main reasons some students start school knowing their ABCs and numbers, and others don’t. And when kids start behind, it’s tough for them to catch up. Related: Theater helps English learners master Common Core: But can it close the achievement gap? This summer, it’s not only Dunn kids who are getting interventions before they start school. 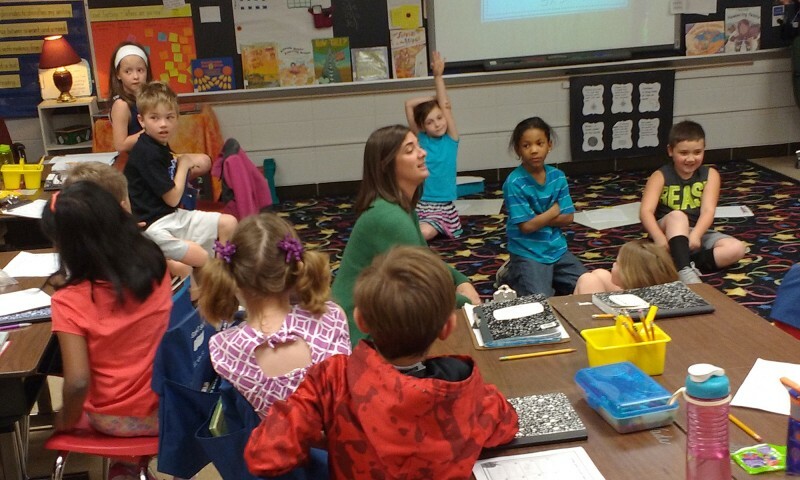 A private group has raised nearly a million dollars to run a four-week kindergarten preparedness program for 1,200 students in Louisville; it may eventually expand to reach all kids entering kindergarten in Jefferson County each fall. The program is an extension of the George Unseld Early Childhood Learning Center in Newburg, a mostly African-American area. The center opened in 2013 to address the achievement gap, and today it educates about 350 3- to 5-year olds who are from low-income families or who have learning disabilities; it also provides extra supports, like dental and vision care. A visit to the center on an early spring day found the kids coming back from planting sunflowers in the garden and having story time with a book that taught them the names of all the vegetables. The children are in mixed-age classrooms where the student-to-teacher ratio is 10-to-1. They are assessed regularly. Data suggest programs like this could help shrink the achievement gap. The children who attended the equivalent of one week or less of the four-week camp scored 47 percent on the Brigance test, while those who attended the equivalent of three weeks or more scored 74 percent, according to figures provided by JCPS. Other educators think that the state and the Jefferson County Public Schools will have to take much more radical steps to give black and low-income students what they need to compete on a level playing field with their peers. In 2012, 25 percent of black third-graders were proficient or better in reading, compared to 54 percent of white third-graders. By 2015, when the majority of those same students were in sixth grade, the percentage of proficient black sixth-graders had inched up 2 points while that of white sixth-graders had increased more than 4 percentage points. Kevin Cosby is head of the historically black Simmons College and pastor of St. Stephen Church. He’s been working to improve the education of the black community in Louisville for more than three decades. The idea of Common Core resonated with him after former state commissioner of education Terry Holliday visited the church to promote it. Holliday “talked convincingly about how schools were failing African-American children and that the new Common Core state standards would change that,” Cosby said. But with the gap stubbornly wide five years after implementation, Cosby said that the challenge as he sees it is “that the core is not always common.” If he had his druthers, he said, schools would have longer hours, provide children with three meals and help them do their homework. Schools would also be open on Saturdays and through the summer. Now Cosby said he is “an ally” of voices that advocate for more resources to be shifted to zip codes where predominately students of color live. This is the goal of Jerry Stephenson, the minister at the Midwest Church of Christ who leads the “Pastors in Action Coalition,” a group of 50 Kentucky pastors who aim to bring charter schools to the state (Kentucky is currently one of eight states without charter schools). A bill was introduced to the state legislature in March and was passed in the Senate but killed in the House. In Kentucky, African-American males are more likely to go to prison than complete a four-year college degree, Terry Holliday said in a recent interview. It’s one of the main reasons he brought Common Core to Kentucky. 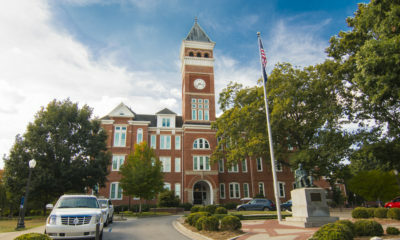 In a 2015 blog post before he stepped down, Holliday argued that it was a “moral imperative” for the state to help more students reach a higher level of learning. To make his case, he presented some “startling numbers” about the present-day situation. The inauguration of Gov. Matt Bevin has since put Kentucky’s Common Core reforms in limbo. Bevin campaigned against Common Core, although his administration may only “tweak the standards,” in the words of the new state education commissioner, Stephen Pruitt, who previously worked at the nonprofit Achieve, a major supporter of Common Core. Common Core’s staying power now depends on politics — and on whether the state’s achievement gap finally starts to shrink. More than five years in, Kentucky may be ahead of the rest of the country on its use of the Common Core, but Common Core’s supporters say the state and the standards still need more time to move the needle. This story was produced by The Hechinger Report, a nonprofit, independent news organization focused on inequality and innovation in education. Read more about the Common Core. Kentucky thoroughly sold its educators on Common Core. How?